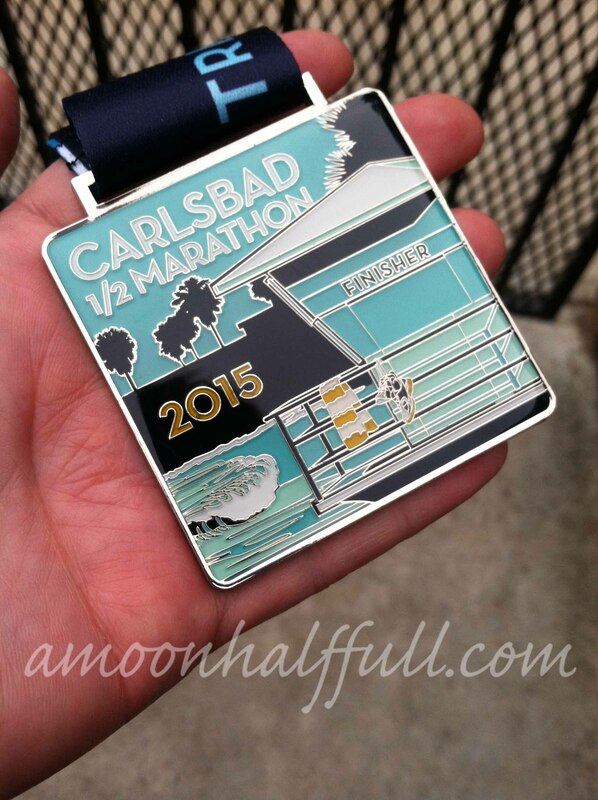 Sometime last year I got it in my head to complete the San Diego Triple Crown series for 2015. Carlsbad is the first in that series. I felt good about my training leading up to that race. I was diligent about my weekly mileage and got in my long runs. Race morning I felt prepared and managed to get some sleep which is hit or miss the night before a race. I ran the Inaugural Star Wars 10k the day before Carlsbad and didn’t get any sleep the night before THAT race which left me exhausted. Plus, I always sleep better in my own bed. After the Run Disney 10k and breakfast with friends, it was time to head South. On the way home from Anaheim, I stopped at the expo in Carlsbad to get my race packet. Parking was a major mess. I followed the posted directions provided by the race people into the mall. Parking where they suggested. Were I to do this race again, I would park on the other side of the mall and walk. That is exactly what I did race morning and I didn’t have any problems getting in or out. I had a hard time figuring out what to wear. I was worried I’d be too cold since it was January by the coast, but didn’t want to be over dressed. I chose to wear capris under my Sparkle Skirt, which has built-in compression shorts. Once the sun came up I was feeling a bit warm with the double layer and wished I had just worn the skirt on its own. Some day I will learn that I live in a climate with perfect weather 98.9% of the time and that less clothes is usually more in this situation. – Tons of porta potties at the start. The lines moved fast. – Relatively flat course with some really lovely scenery. – Plenty of water stops. In fact, so many that I decided I would not run with my Camelbak. I realized fast how huge of a mistake this was. I should have known better than to try something new on race day. I think I ended up over hydrating a bit as I was drinking lots of water at each stop. I am used to just taking small sips periodically from my Camelbak whenever I feel the need. By mile ten, I was pretty much done running. I was fatigued and had mild stomach cramps and had to muster the gumption to run through the finish shoot. I felt wiped out the whole day after the race and in retrospect feel like I probably should have stopped in the medical tent for an evaluation. At the time I thought I was dehydrated and that I just needed some electrolyte replacement. Some day I may figure out how to hydrate during a half without bringing my own fluids but until then I will continue to use my hydration pack. – Comfortable sized race. Not too many people. Plenty of space to manuever around. I noticed that most people exercised proper race etiquette and would move over to the right when they were taking a walk break. – Beautiful medal. They out did themselves. It looks like enamel. I loved that I didn’t see the medal until it was put on my neck. There were no sneak peeks posted on social media. While I usually love getting a glimpse at the medal, it was nice to be surprised for a change. – This was a well-organized race. Packet pick up, aside from the parking, was a breeze. Race morning from start through the finish was well run. Cons: The only real negative thing I can say about this race is the style of course. It is an out and back course and I am just not a fan. They always seem a bit boring to me covering the same territory to and fro. It is this reason that I am not chomping at the bit to do this race again. I imagine since it is one of the good local races, I will be enticed to try it again perhaps in a few years. The best thing about an out and back course however is getting to see the fastest runners on the other side of the road. They are always amazing to see. In the end, I managed to PR and yet I was still disappointed in my performance. I can only think about how well I would have done had I not started to lose it at mile 10. I did the best I could at the time and all in all the race was great and a really good experience.